Welcome to Naples Eye Physicians where we offer the latest in ophthalmology services. We accept patients from Naples and the surrounding communities. Learn about our vision and eye health services to schedule your next appointment with confidence. We have been offering high-quality eye care since the 1960s, and are proud to be one of the most established vision centers in Naples. Our ophthalmologists in Naples strive to keep you happy and informed about your vision and eye health. We follow the latest techniques and advances to best preserve your vision and care for your eyes. When you come to see us for our signature services, rest assured that you will be in good hands. Eye Surgery - We offer the latest techniques for outpatient eye surgeries including cataract surgery, LASIK, YAG laser capsulotomy, malignant and benign lesion excisions, ptosis repair, and upper and lower eyelid blepharoplasty. Eye & Vision Exams - We offer comprehensive eye and vision exams to check your eye health. Contact Lens Exams - Are you thinking of trying contacts? Let us test your eyes, measure them to get the right fit, and walk you through your choices regarding lens type. Treatment & Management of Eye Diseases - We offer comprehensive treatment and management of eye conditions including glaucoma, diabetic eye disease, macular degeneration, dry eyes, blepharitis, conjunctivitis, and vitreous floaters and more. Advanced Diagnostic Testing - You may be referred to our Naples clinic for advanced diagnostic testing. We can administer an optical coherence tomography (OCT) test to take a cross-section image of your retina, as well as measure the nerve fiber layer of the optic nerve. We can also test your visual field in terms of horizontal and vertical vision, or perform IOL Master testing before cataract surgery. By measuring the length and curvature of your eye with a laser, IOL Master testing can help us achieve better optical outcomes. Botox Cosmetic - Ophthalmologists are the best choice for Botox injections, since we have been using Botox for eye treatments for more than 20 years. We can perform cosmetic injections, as well as administer Botox for muscle spasm, eye twitch, overactive blinking, and other eye problems. 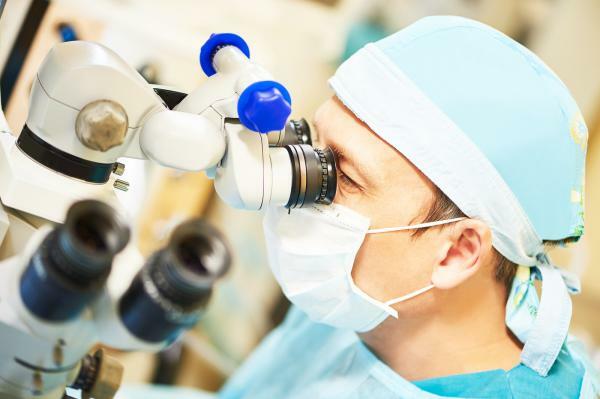 Laser Vision Correction- Not only do we offer consultations for laser vision correction surgeries like LASIK, we also perform the surgeries right in our Naples office. If you are over 18 years old and want to see clearly without the use of glasses, schedule a consultation with us. There, you will learn about the different types of laser vision correction we offer, find out if you are good fit for surgery, and discover the costs associated with laser surgery. Do you have an eye problem that we can assist with? We would be more than happy to consult with you. Schedule your next appointment by calling us today at 239-262-6288 or by using our online appointment request form. We look forward to taking the very best care of your eye health today.